It is such an honour to have Destri, the founder of The Mother Huddle with us today! It's so easy to get lost in all the Mother Huddle has to share: recipes, sewing, crafts, style, beauty, parenting...you name it, you'll find it there. And it's all presented so beautifully! Destri's creations are always so gorgeous and immaculately finished, so it's no wonder she came up with this stylish (and surprisingly easy-to-make!) knock-off that looks like it's straight out of a high-end boutique. Thank you for sharing your creativity with us today, Destri! Hi friends! Destri from The Mother Huddle here, nice to meet you :). I have my all time favorite knock-off for you today that is about as easy as it gets. 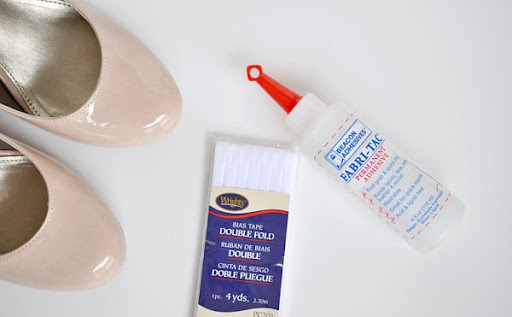 While it doesn't involve a sewing machine, it does involve one of my favorite sewing mediums. Bias tape. I use it whenever I can. I think I could even start a blog dedicated to projects on the stuff. 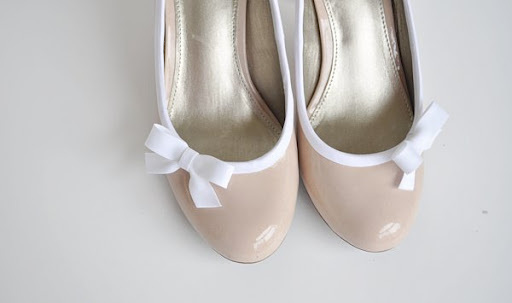 Anyways, this is a great way to personalize a pair of shoes to go with all those fabulous clothes you make, sound good? Let's get to it. Steps: First, iron the bias tape so you can't see where it was folded over on the packaging. Do Not Iron Out The Double Fold! 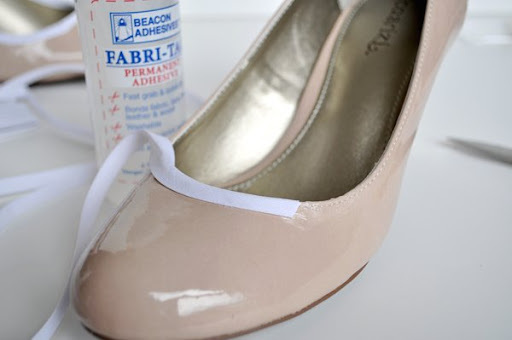 For lining the shoe you will use the ¼ inch bias tape. Start on the outside edge just below the curve. This is the place you will put your bow in the end, so make sure to start where you want the bow. I ran a thin strip of glue along the outside edge and then smoothed it out with my finger a bit. You do not want the glue to thick, or it will seep through. 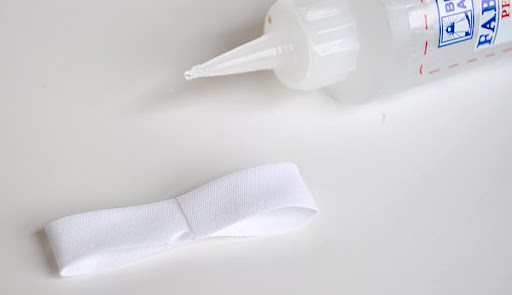 Remember, when it comes to fabric glue, less is more. Next make sure that the wider part of the bias tape is on the outside (the side that will show). Then just press it over the edge of the shoe and run your fingers over it to secure to the glue. 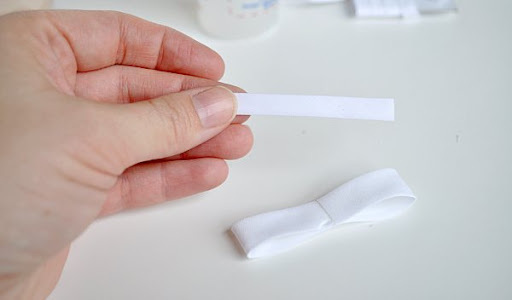 The glue doesn't dry super fast, so you will have a little bit of a chance to work with it. 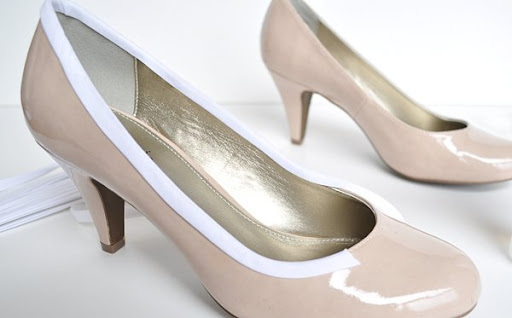 Work around the shoe in about 3 inch sections, making sure to smooth the tape as you go. I did glue the inner edge as I went along, but you could wait until the end if you want. Whatever is easiest :). 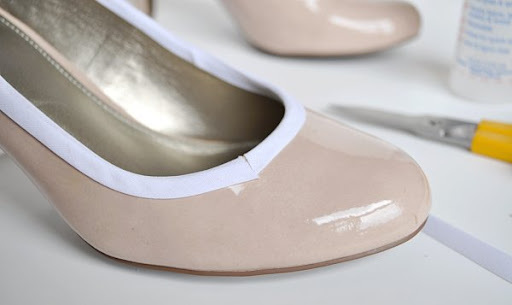 Like I mentioned, the bias tape curves nicely, so just bring it around the toe of the shoe carefully, and snip the end to match where you started. 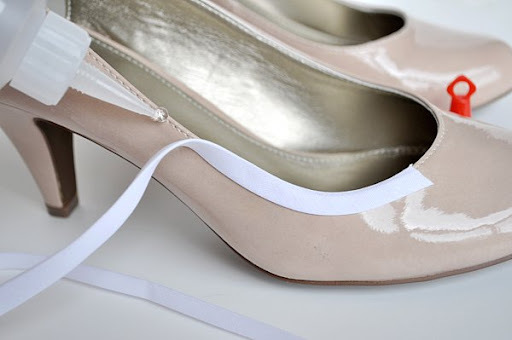 For the second shoe, start again on the outside curve. I went the opposite direction than the first shoe, so that the widest part of the bias tape was on the outside again. Repeat the same process as the first shoe. Easy right? Now we can work on the bows. 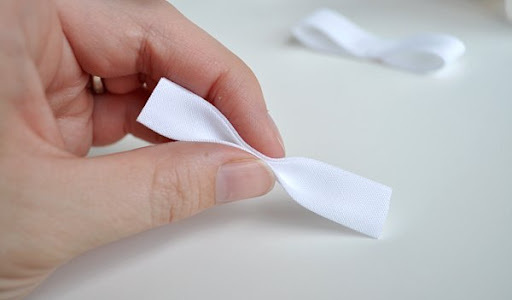 You will use the ½ inch bias tape for the bows. Cut a five inch piece with straight ends. 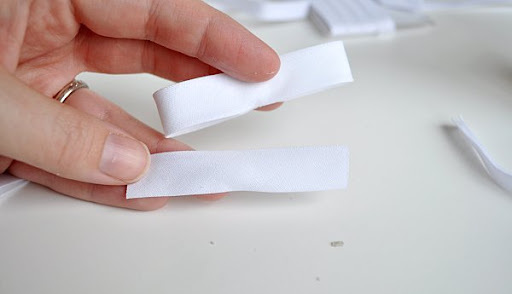 Open up the piece and run a thin strip of glue on the inside, then fold in half again and secure with fingers. 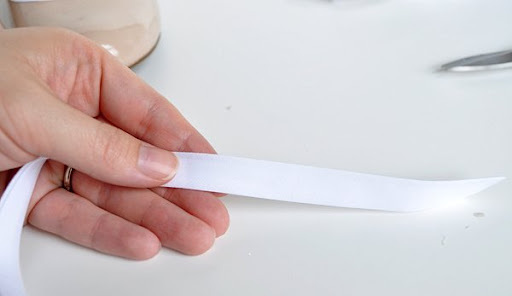 With the widest part of the bias tape facing down, dab a little glue on the center of the tape. Now pull the ends over to meet up in the center; hold with fingers to set a little. And a 2½ inch piece from the ½ inch bias tape. 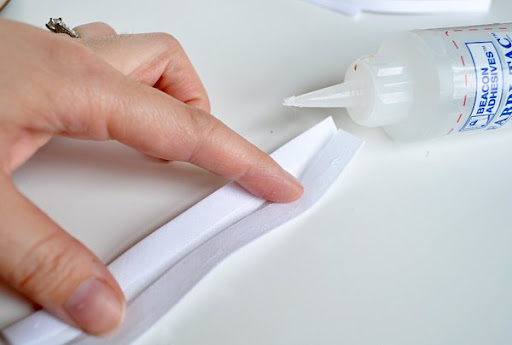 Dab a little glue on the center of the ½ inch piece, and pinch in between fingers like shown. Hold until set. 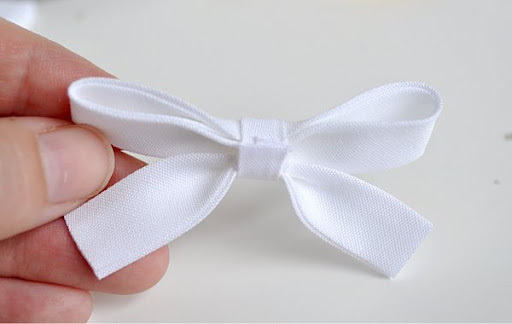 To make the bow, you will place the 2½ in piece on the underside of the bow, then wrap with the ¼ inch bias tape. Play with it until you like the way it looks then put a little glue on the back. This is the backside of my bow, I just overlapped the middle strip and glued. Hold until set then trim the excess off. Cut the tips at an angle and run a little glue over the tips. Now just glue the bow on over the seam. You're finished! I went around all the edges with the glue just to make sure everything was good and secure. This is how they look on. I've had them for over a year and they have held up great. I made a pair for my little girl, but they were left in another state (long story) so I don't have a pic of them. Which is unfortunate because they were even cuter than mine. I used some floral bias tape I bought from Polly Danger and added it to some green flats. Then instead of a bow, I added a matching fabric flower. I think this would be super cute to do for little girls shoes to go with their Holiday dresses. 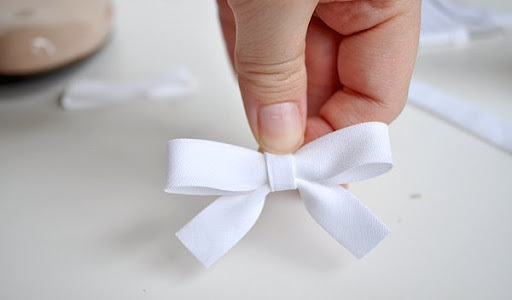 Just make a little holly with felt and glue in place instead of the bow. So there you have it, my all time favorite knock-off! Thanks so much for having me Heidi! 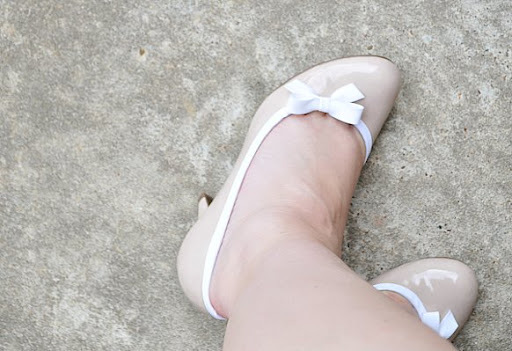 8 comments on "Knock it Off - Destri from The Mother Huddle"
love this - too bad I don't have a basic heel to embellish at the moment, but maybe if I see some at Goodwill!!! So cute - what a great idea. I love these. =) I think it the trimming would be adorable on flats as well. What a cute idea. I agree it would work really well on flats too. I love this, Destri! What a great, simple idea. Can't wait to try it out! Knock it Off - Simple Simon & Co.